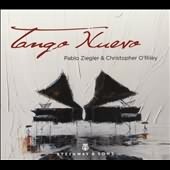 This instrumental piece constitutes the fifth scene of Piazzolla's tango-chamber opera María de Buenos Aires, in which the heroine leaves the suburbs and wanders through the heart of Buenos Aires. In the arrangement most commonly encountered today, the fugue begins with an agitated bandoneón solo that jitters around the scale and then is echoed in turn by the other instruments of the chamber ensemble. After about a minute and a half of fugal writing, a full-fledged tango takes over, swift and gritty. Suddenly everything comes to a halt, and the "mystery" section begins with a slow, lyrical melody related to Maria's main theme; this music gradually vaporizes.